Challenging status quo suggestions, the inventive work of seasoned sculptor Douglas Walker blurs the lines between form and function, art and craft, the surreal, sublime, whimsical and joyous toward the often mysterious and ultimately profound. The award winning Canadian sculptor of semi-precious metals includes brass, copper and silver, bound with elements of formed glass and long discarded recycled objects to form kinetic works of engineered magnificence storied with layers of charm and luster. Acclaimed for his ingenuity, inventiveness and audacious creativity, Douglas Walker produces his pieces to the scale of his own deeply passionate character and soaring eclectic sensibility. From his studio workshop alchemical relationships are made between materials brazen by fire, fused by water and framed by the wind, waves and wilderness of his Vancouver Island home. Over the last twelve years Douglas Walker has produced over 2500 unique works sold around the world throughout Canada, the United States, Europe and Australia. Featured installations have been showcased in the Comox Valley Airport, the City of Vancouver, Nelson BC, Mason City IA, Kingsbrae Garden NB, winning the People’s Choice Award at Castlegar BC’s SculptureWalk and Best in Show at Mason City IA’s Sculptures on Parade. Artistic integrity merges with mechanical excellence making Walker’s works renowned for their enduring construction and timeless quality. 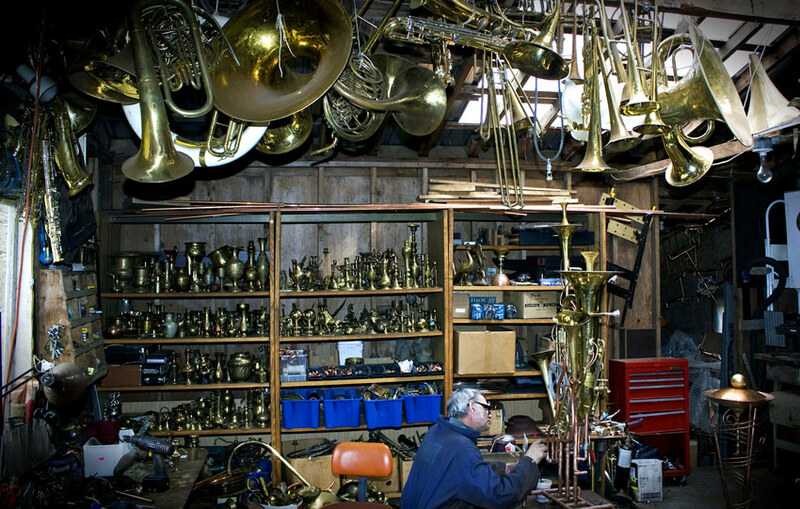 His musical instrument sculptures age graciously with time receiving patina as they absorb the elements outside or glimmer proudly protected indoors. The compositions seem to develop their dream like quality even further over the years, inviting the viewer on a journey of unlimited imagination. Experience the sculptor’s most current work displayed in his garden gallery at the home of Douglas Walker and Jann Hall. Their home and studio can be found in the heart of the Comox Valley’s beautiful Black Creek, British Columbia.